Brothers Adolf and Rudolf Dassler set up a shoe company in their mother’s laundry room in the town of Herzogenaurach, Germany, in 1924. But it soon became apparent that the brothers had different personalities, and tensions between the two came to a boiling point during World War II. Rudolf was sent to war, and after his return, was picked up by U.S. soldiers and imprisoned for about a year. He reportedly was convinced that his imprisonment was organized by his brother. 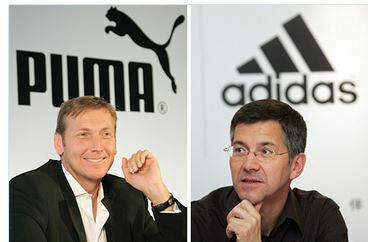 The brothers split up in 1948, and Rudolf Dassler founded the company that would become Puma. Adi formally registered Adidas in 1949. The rivalry between the brothers even divided the town of Herzogenaurach, where Adidas and Puma still have rival factories on opposite sides of the river. That came to a symbolic end on Global Peace Day in 2009, though, when employees of both factories played football together, pitting mixed Puma and Adidas teams against each other. The “Black” team of the companies’ CEOs beat the “White” team 7:5. Posted on Sep 22, 2017 Sep 20, 2017 by Inglés MálagaPosted in Grammar, Reading, VocabularyTagged aprende ingles malaga, b2, c1, phrasal verbs. Next Next post: Join the European Researchers’ Night! Discover science, meet researchers, and enjoy yourself!